This outpost near the Klingon border mostly comprised of storage areas and industrial fabrication facilities. Federation outpost near Sherman's Planet, located one parsec from the nearest Klingon outpost. A Federation development project for Sherman's Planet in 2267 was threatened when some 1,771,561 tribbles infested storage bins of quadrotriticale intended for the project. Most of K-7 consisted of storage facilities, and relatively little was habitable. Unknown to anyone at the time, a former Klingon agent under the aliase Arne Darvin, from the year 2373, traveled back to station K-7 in 2267 in an attempt to change the outcome of the Sherman's Planet incident. Starfleet personnel from 2373 prevented Darvin from changing history. Stock footage of K-7 was later reused in "The Ultimate Computer" (TOS), although it represented another station. 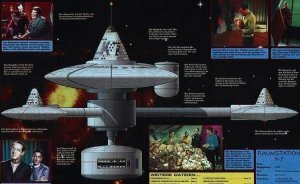 Although Deep Space Station K-7 was near Sherman's Planet, an area first explored in 2067 by John Burke, it was a free-floating structure that was not in plantary orbit. Its main section was shaped like a flattened sphere with a thick center that tapered to a point at the edges, and was the area of the station that contained most of the storage compartments. Above the main section was a dome where the leisure and living facilities were located. On top of this was a long, thin structure that was a communications mast. Thin tubular arms attached the three smaller saucer sections to the main hub, and at the bottom of the space station there was a shuttlebay. The station had some leisure facilities, and its main attraction was the bar which also sold exotic merchandise and souvenires. Day-to-day operations on K-7 were supervised by Mr. Lurry. Middle-ranking bureaucrats, such as Nilz Baris, have also been based on the station.